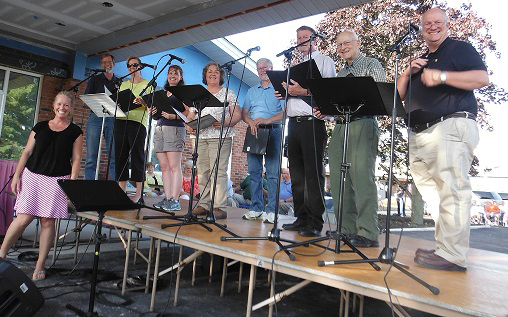 Generations at Neighbors was proud to host and sponsor ByronFest’s Grand Opening with GospelFest in July. GospelFest is a celebration of music with talent from local churches and local area acts. Generations at Neighbors residents, family and friends, as well as local community residents sat on our lawn and enjoyed the beautiful weather and live music. Generations at Neighbors has sponsored GospelFest for close to 20 years. Kim Kilmer Ness a previous Generations at Neighbors employee started and organized GospelFest for over 30 years. Our admission director – Patti Kilmer now organizes the talent portion with help this year from Kim Hughes our activity director. The evening started with the host- Nicole from Generations at Neighbors dietary department welcoming all of the friends, families and visitors to GospelFest. Our local pastor opened with prayer followed by a great and rousing speech by a Byron Chamber of Commerce representative and before every performance Nicole took the stage and led the audience in singing hymns. Performances included the United Church of Byron, St. Mary’s Church, Cornerstone Family Church and Josh Hendrickson. The featured group was Spirit’s Harmony, an Acappella Christian Quartet that has been spreading their harmonious sounds for over 10 years. After all the performances a representative from St. Mary’s Church explained the St. Vincent DePaul Society and how the guests’ generous donations will be used. As the sun set on the event, our local pastor closed out the wonderful evening in prayer and invited everyone for pie, cake or ice cream that was donated by the local churches. The attendees remarked at how much they enjoyed the music, the prayer services as well as the peaceful environment. ByronFest is held annually during the second full weekend in July by the Byron Chamber of Commerce and will be celebrating its 30thanniversary next year. The family festival also hosted a carnival, Taste of Byron, 5k run, classic car show and more during the three day weekend. We are so happy to be a part of ByronFest yearly and cannot wait for the 30th celebration.